Over three generations, the Dietrich sisters' ties to USC have only grown stronger. Some USC alumni have been Trojans since birth. For the Dietrichs, there was no question where the children would go to college. You might say they’re just a USC family. Growing up in Downey, California, the Dietrich sisters loved watching their father, Daniel ’50, and mother, CaroLynne, get ready for football game day. “They’d dress to the nines, with mom wearing a chrysanthemum corsage decorated with pipe cleaners spelling out ‘USC,’” Danielle Dietrich Kilpatrick ’73 remembers. Years later, Danielle and younger sister D’Arcy Dietrich McLeod ’78 would do their part for Trojan spirit as USC Song Girls. “For my father, who had no sons to play for the Trojans, it was wonderful to be able to watch his daughters cheer for the team,” D’Arcy says. Their father, a World War II veteran, attended the USC Marshall School of Business on the GI Bill. He passed away from a heart attack at age 51 during D’Arcy’s sophomore year. Gratitude rings in her voice when talking about how the Trojan Family stepped in to help. “At a time when I needed it most, Town & Gown gave me a full scholarship. I wouldn’t have been able to stay at USC without it,” D’Arcy says. USC was also instrumental in Danielle’s career path. After graduation, she began working at the university while pursuing a master’s in broadcasting. Midway through the program, she received a job offer. That’s when she realized that she liked where she was: “Everything happening in the world was reflected in some way on campus; it was incredibly stimulating.” She turned down the broadcasting job and went on to a 16-year career in USC’s public relations, development and alumni affairs departments. She served as a director in the alumni association. Over the years, the family’s ties to USC have continued to grow. Their mother, CaroLynne, remarried after meeting Frank Mattison ’50. Danielle married her high school sweetheart, David Kilpatrick ’73, and had two sons, Daniel ’06 and Dustin ’08. 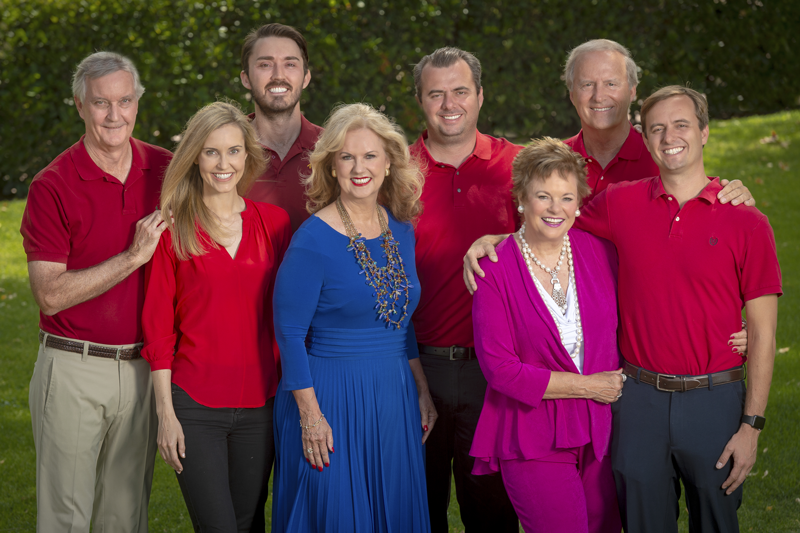 D’Arcy married David McLeod ’72, whom she met after earning a teaching credential at USC, and soon to follow were daughter Devon ’05, who also was a USC Song Girl, and son Dane ’09. The sisters’ involvement with the university has evolved. 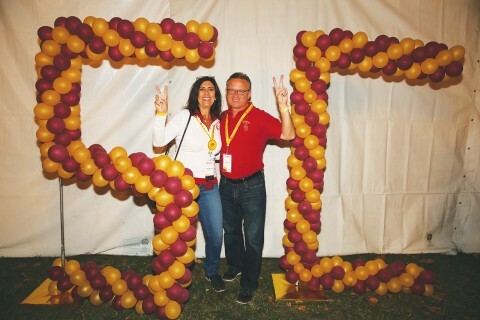 Danielle describes D’Arcy as “the ultimate volunteer.” D’Arcy’s resume includes the USC Alumni Association Board of Governors, Alumnae Coordinating Council, Town & Gown, Trojan Guild of Los Angeles and Trojan League of Los Angeles. She is co-chair of the Class of 1978’s 40th reunion and has served on various councils, including one for Kappa Alpha Theta, the sorority that she, Danielle and Devon pledged. For her part, Danielle is a member of the Trojan League of Orange County and Skull and Dagger, and was vice president of the Kern County Alumni Club. She also started USC Trojan Travelers, an alumni program that she credits with her family’s love of globetrotting. At latest count, 24 members of the family have attended USC. But Danielle and D’Arcy predict the number will rise. Already, Dustin loads his children—ages 4, 3 and 1—into a triple stroller to visit campus and catch Trojan football games. Do you have a big family of USC alumni? Share your family’s story by emailing USC Trojan Family Magazine, and we may publish a selection of these stories in the future. Every day feels a bit like a Trojan reunion for the Gehring family of four architects. The first paragraph of their love story starts with USC. Tracey and Ross Necessary show the love and loyalty to their alma mater.